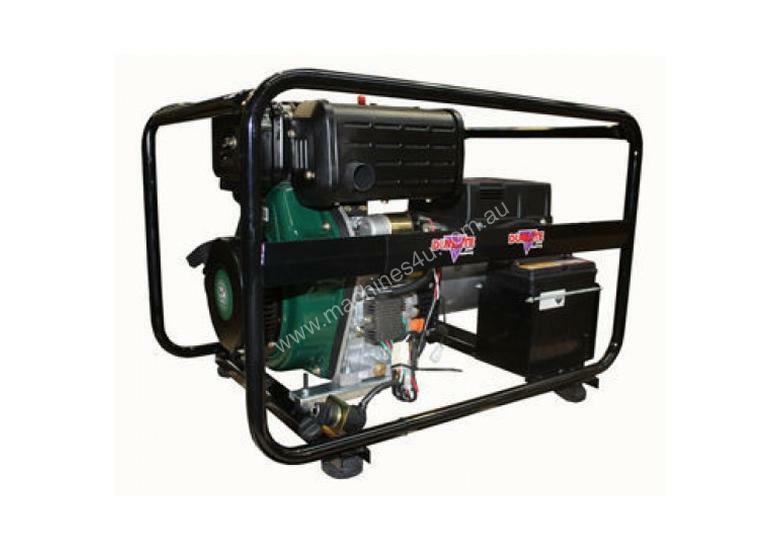 Searching for a portable diesel generator thats great for trade? Here it is. This unit combines reliability, economy and everything else we love about diesel with robust generator features. The result is one tough generator that delivers for every job.The generator is powered by a solid British designed Lister Petter diesel engine with an electric start to provide a continuous output of 5600 watts. With a 5-litre fuel tank, the generator can run for three hours at 80% load.Take advantage of the optional extras to create a tough generator you can rely on for many years to come.RRP: $3,560Save $471 (13.2%) off RRPContinuous Output5600 wattsAlternator TypeNSMEngineAir Cooled LISTER PETTER K172EType10 horsepower engineStarting MethodElectricFuel Tank Capacity5LCont. Working Time3 hrs 80% loadProduct Dimensions (mm) LxWxH810x545x545 (L x W x H)Net Weight (kg)110.0 KgFuelDieselOutlets2 x 15 AmpNOTEThis is a portable air-cooled diesel generator designed for short term/standby applications. For prime/continuous power, a stationary water-cooled diesel generator is recommended.